I recently discovered this fascinating world of YouTube videos featuring empty products. The gist is that the person shows you products they've finished up, gives a mini review, and tells you if they would repurchase. For whatever reason, I've found these videos to be not only captivating, but also really inspiring. I'm somewhat of a product junkie and rarely purchase the same thing twice. I also always want the next new thing before I've finished up what I have BUT starting to stock up my "empties" has been REALLY motivating for me! I'm actually quite impressed with how much stuff I finished up, especially some products that have been hanging around for awhile. I'll also say that this little project has helped me let go of products I really don't like very much even if I haven't finished them. I've given them away or if they were cheap, just tossed them which for me is SO liberating. Below you'll find a quick, mini recap/review of the product and if I would purchase again. Leave any questions in the comments! This lasted me a long time so even though it's expensive, it could be worth it if you're really into facial oils. I did get it from the Birchbox shop with some points so I didn't pay the full $40. This was my first foray into face oils and it was a good transition. Seemed to be effective but wasn't life changing enough for me to repurchase. I'll keep testing other facial oils because I do like them and I'm waiting to find one that gives me outstanding results. Recommendations? This tiny pot lasts and eternity. The salmon color helps counteract the blueness under your eyes which I liked and it did seem to make things brighter. Eye cream is a weird product to me because I always use it but I'm not entirely sure it's doing anything. I still feel like I need to keep doing it because in like 15 years I'll be thanking myself. I'm currently using the FAB one which is formulated very similar but it just has this cooling metal tip which I love. Picked this up on a whim at a natural foods store last summer and found myself reaching for it often. It was great under makeup because it wasn't too greasy but had decent hydration. I'm on the hunt for my next face moisturizer purchase but I may be picking one of these up again soon. I bought this face wash (Chia Whip) after I tried a sample at the W3ll People store in Austin last summer. 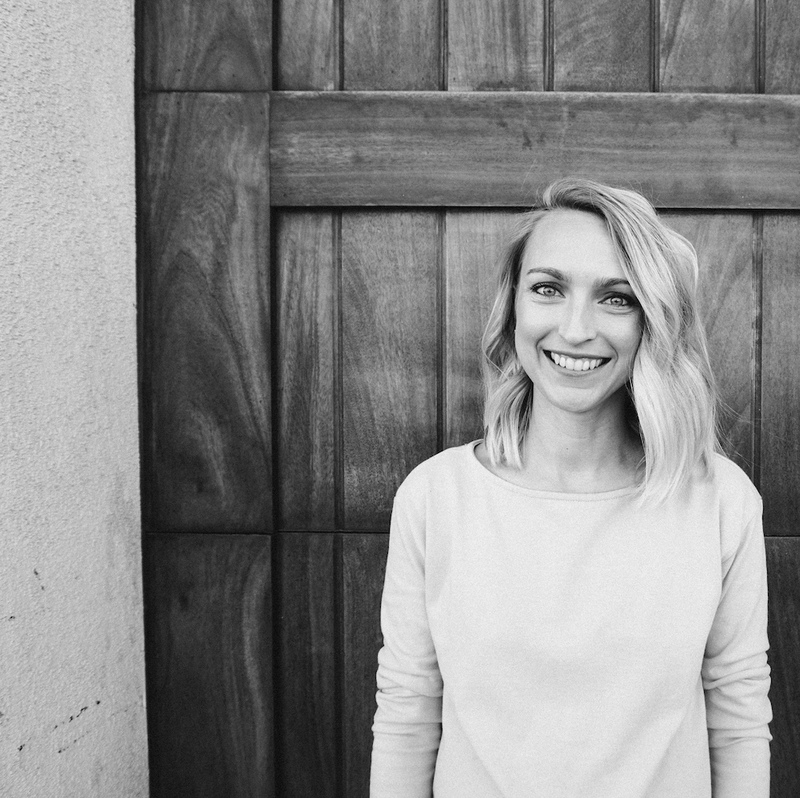 I was just getting on the green beauty kick and loved that I could read all the ingredients. I also liked that it was foamy and gave me that "clean" feeling I was still craving (before transitioning to oil cleansing). I bought the Apple A Day version shortly after that because I wanted to keep one i the shower and one at the skink. Both bottles lasted a really long time and I think I would repurchase in the future after I finish up a few other things I already have. You may be seeing a trend here but around the same time I purchased the OLO products, I also discovered W3ll People. This was the first product I purchased from them in their Austin store last summer. This setting powder was really good because it had a slight tint so it could be used on "no-makeup" days as well. At the time, I was looking for something to use over tinted moisturizer in the summer to keep the shininess at bay. It's definitely a great product but there are other setting powders out there that I'm curious to try like the RMS un-powder. This is SUCH a great brand for the green beauty lovers out there. All their products are made with 5 ingredients or less which is outstanding. I ordered one of their mini-kits a while back and fell in love with the toner (still using the mini makeup remover oil, it lasts forever!). It's made with AMAZING skin loving ingredients. It's a little pricey for what it is so I may try making it down the road. For now, I'm using this one which I do like. I love this line mostly because it's super effective, sulfate- and paraben-free, and smells freaking AMAZING. I likes this clarifying shampoo a lot because it got all the product out but didn't strip my hair or make it feel brittle (like most other clarifying shampoos). Their stuff is expensive but since I only used it about every 10 days or so it lasted me a really long time. You do need to purchase it at a salon or specialty beauty store. I'm now using this clarifying shampoo mostly because it's more natural. This stuff was fine but not my favorite. I used it up out of necessity because I went through a point where my scalp was really itchy and flaky. I'm not sure what was causing it but it's much better now. 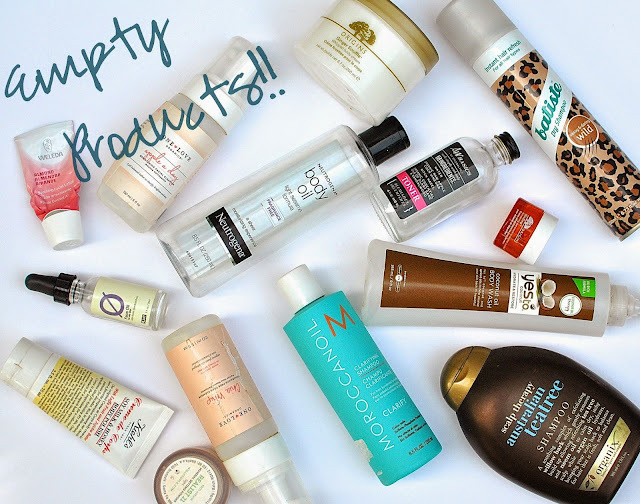 I don't have a current need to repurchase. I'm probably on my 4th or 5th bottle of this stuff. Best dry shampoo out there and for a great price. It smells awesome and it's a spray powder so it's not all wet and sticky. It doesn't give your hair texture which I like because some days I just want to de-grease and not add texture. I usually pick up a different scent every time but I liked this one (Wild) a lot. They have a new tropical one out that I'm currently using and loving. I love Origins Ginger scent and bought this whipped body cream about a year ago. It lasted a long time and did a great job hydrating without leaving a greasy feel. I liked that the scent lingered slightly but didn't overpower. Like most things, it's good but I love trying new products so I'm already on to this body cream and probably won't repurchase unless I get it as a gift. I've had this for AGES and I don't really know why. I love the texture of it and it does a great job both scrubbing and moisturizing. It's particularly great for prepping skin for self-tanner or for getting off the last bits of a self-tan. I already have a new scrub in the shower though so I won't be repurchasing. I just think it's too expensive for what it is. I bought this when the line first came about because...coconuts. Previously I didn't use body wash because I preferred bar soaps but thought, what the heck. I liked it just fine but it didn't blow me away. It smells great but I've gone back to using bar soap or The Body Shop shower cream. I originally bought this as a moisturizer but it was way too greasy for my liking. I then used it as a bath oil because when I got out, it made my skin super soft and it really sinks in better. But then I got the bright idea to use it as a shave oil and really loved it. I don't think I'll buy this same kind again but I do think I'll purchase another "dry oil" to shave with. Thanks for the reviews, Aless! Question...you said you've moved to oil cleansing? I bought my first one and I think I like it, but what do you recommend? xo! Yes! So my favorite so far is from One Love Organics, it's the Vitamin B cleansing oil but it's a bit of a splurge. I've also made one from avocado oil, mauka honey and castille soap and that is a great cheap alternative. 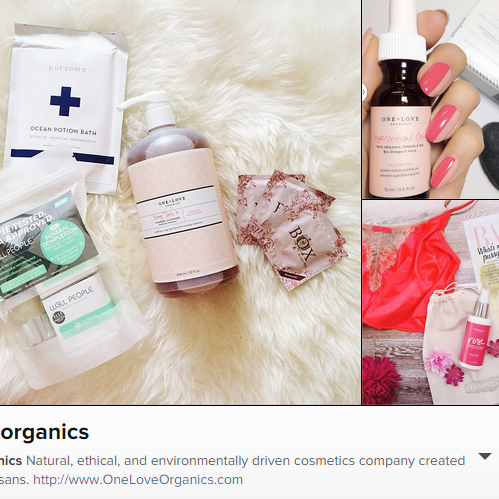 I'm such a fan of One Love Organics! I miss my Chia Whip. Mine lasted a long time, too! I'll have to look into the Apple A Day now- thanks!